A sound understanding of cerebral and spinal cord physiology is vital for the delivery of safe perioperative care of patients undergoing anesthesia for neurosurgical procedures. This chapter covers key concepts in cerebral and spinal cord physiology, with particular attention to clinical relevance for the neuroanesthetist. Cerebral metabolism, cerebral blood flow and autoregulation, intracranial pressure, and cerebrospinal fluid physiology are reviewed. In addition, relevant pituitary and spinal cord physiology is also discussed. 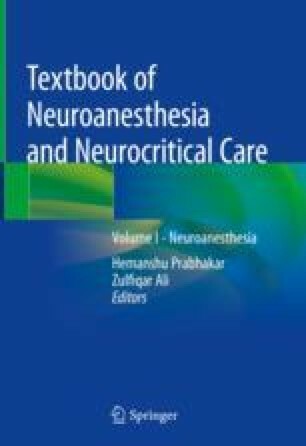 The chapter is intended to provide those involved in the care of neurosurgical patients with updated concepts in core physiological principles that underpin the practice of neuroanesthesia and neurocritical care. Ranalli LJ, Taylor GA. Neuroanatomy, neurophysiology, and neuroanesthesia. 2016. https://aneskey.com/neuroanatomy-neurophysiology-and-neuroanesthesia/. Accessed 1 Feb 2018. Hacking C, Knipe H. Spinal Cord Blood Supply. 2017. https://radiopaedia.org/articles/spinal-cord-blood-supply/revisions. Accessed 1 Feb 2018.